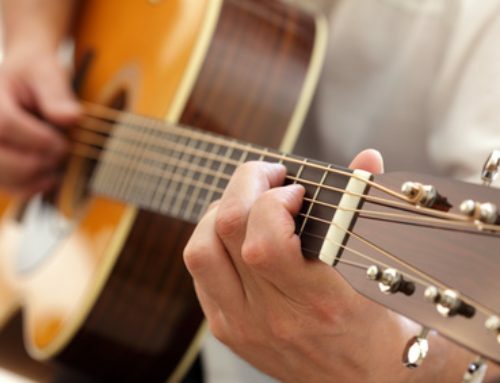 There are two ways to hold a guitar whether it is acoustic or electric. 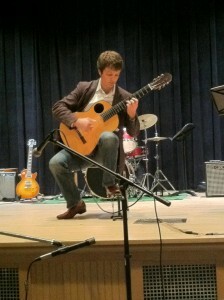 If you’re playing classical guitar, you should place the waist of the guitar on the left leg, just behind the knee, and wedge the guitar between the left and right leg. You should also put your left foot on a foot rest to raise that leg up, being sure to angle the neck of the guitar slightly upward so the body of the guitar is lower than the headstock. 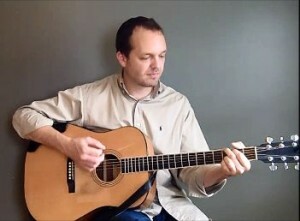 Rest the edge of the guitar against your chest, and wrap your right arm around the front of the instrument. Take a look at the pictures below for more clarification. If you’re playing a steel string acoustic guitar, you can hold it the same way as described above, but it’s more common to rest the guitar on the right leg. For this style of holding the guitar, you don’t need a foot rest, but you should try to keep your left leg a little lower than the right. Hold the guitar so it’s tilted a little against your chest and wedged between your leg and chest, with your right arm wrapped around the front. It should feel like it’s secure and won’t move as you strum. Check out the photos below. 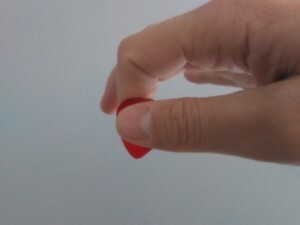 Learning how to hold a guitar pick is easy as long as you are patient with yourself and use the right kinds of picks. The correct way to do it is to hold the pick between your thumb and the side of the index finger as shown in the photos below. Keep a light grip on the pick – as light as you would hold a pen or pencil – and don’t leave too much of the bottom of the pick showing or it will flex too much when it hits the strings.